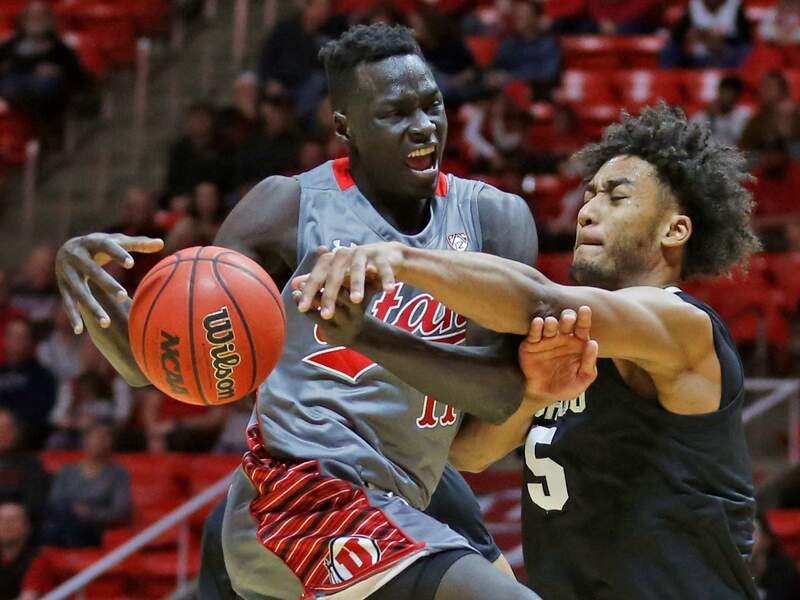 Utah forward Both Gach, right, lays the ball up as Colorado guard Daylen Kountz looks on during the second half of Sunday’s game in Salt lake City. Colorado guard Eli Parquet guards Utah guard Sedrick Barefield (2) during the second half of Sunday’s game in Salt lake City. Colorado guard D’Shawn Schwartz defends against Utah forward Both Gach as he goes to the basket during the second half in Sunday’s game in Salt lake City. SALT LAKE CITY – Utah didn’t let a week off between games go to waste. The Utes used their extra practice time to put additional emphasis on having active hands and active feet on defense. All of that increased focus paid off big time against Colorado. 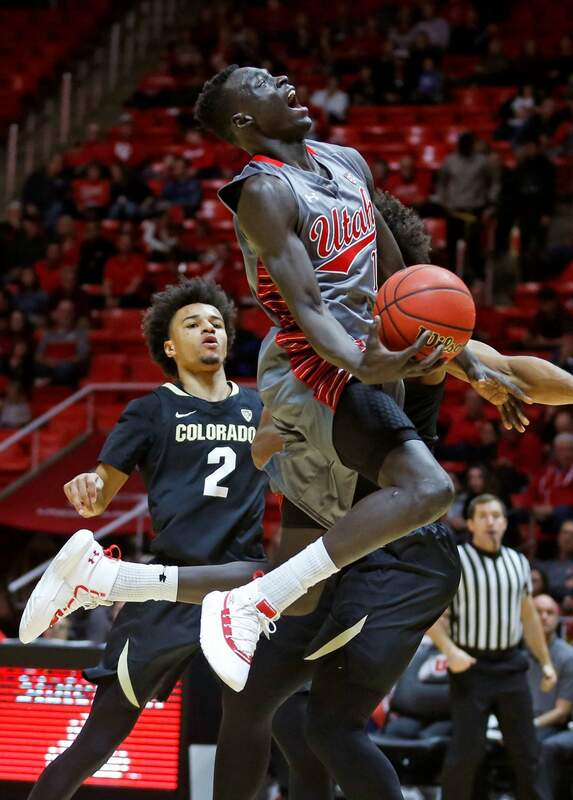 The Utes beat the Buffaloes 78-69 on Sunday night after smothering Colorado’s offense for a large portion of the game. Utah crashed the boards, grabbed steals, and stampeded the Buffaloes for one transition basket after another. McKinley Wright IV, Colorado’s starting point guard, did not play after suffering a left shoulder injury in the first half of the Buffaloes’ 77-70 loss to Washington on January 12th. Namon Wright returned to the lineup after missing three games with a foot injury. At one point during the run, Both Gach and Allen three down dunks following steals on three consecutive possessions. Utah had a 17-2 advantage in fast-break points in the first half, largely because the Utes made an extra effort to disrupt passing lanes. Colorado cut Utah’s lead to 70-60 with 3:28 left on three consecutive baskets from Kountz and Gatling. It was part of a run of five straight field goals for the Buffaloes. Gach drained a 3-pointer to keep Colorado from trimming the deficit to single digits. Allen added another jumper a minute later to push Utah’s lead to 76-62 with 2:01 remaining. ALLEN ASCENDINGFilling a stat sheet has been Allen’s trademark all season and he keeps getting better at finding ways to do it. The freshman forward is averaging 14.2 points, 7.0 rebounds, 3.4 assists, and 1.6 steals for Utah in Pac-12 play. BATTLE OF THE BOARDSUtah edged Colorado on the glass 38-37. The Buffaloes came into the game averaging 37.8 rebounds with a plus-5.7 rebound margin, ranking fourth in the Pac-12 in both categories. QUOTABLE“Maybe it was my fault, I thought I told my guys that the game started at four today. They thought it started at 5:30.” – Boyle on Colorado’s sluggish first half play. THE BIG PICTUREColorado: Playing without Wright effectively short circuited the Buffaloes’ offense. 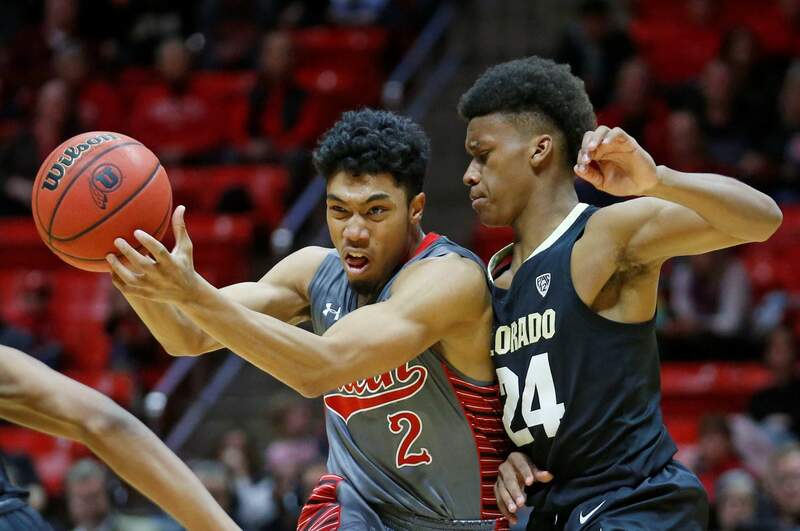 Colorado struggled to adapt to Utah’s defensive pressure and committed a flurry of early turnovers to fuel a blowout win for the Utes. Getting Wright healthy and back in the lineup will be critical if the Buffaloes want to get on track in Pac-12 play. UP NEXTColorado visits California on Thursday.